We already know and love what you are doing out there with your blog, your friends and followers, and Nuun so we want to show our appreciation by giving you a personal invitation to apply to our all ladies, all bloggers team. The invitation to apply will go out to the masses within the next 48 hours but we wanted to give you a personal 'shout-out'. Please- feel free to pass the attached invitation onto blogger friends before then! We would love to hear from your friends and fellow runners/bloggers, and hey, who knows, you and a buddy could be doing HTC 2011 together! Among other things we will hang out with the Nuun staff in Seattle, do crazy decorations to the team vans, caravan to the start from Seattle to Mt.Hood, run all night long, and then celebrate on the beach at the finish. It will be a great weekend! All we need from you is the 'creative application'. Please see attached invite for more info, deadlines, and where to send the application (do not reply to this email address!). -I would be the first to get hit by lightning in inclement weather. Bringing "take one for the team" to a new level. -I can see above crowds, other runners, vans, etc. this is very useful in busy areas and if a teammate goes MIA. -I am easy to locate so hand-offs/transitions would be spot on. -I won't complain about tight quarters because I am used to being jammed in places I don't fit in well. -I have big clothes so if you are cold, grab my sweatshirt, it is sure to feel like a blanket. -I always have an extra Granola bar and bottle of water to drop your Nuun tab in. -I rarely get to eat a full meal or have a full night of sleep, so the trials of the relay will be minimal. -Feel free to throw-up should you need to, I will hold your hair back. -The crying, fussing, and nagging along the way will not phase me, I am used to taking care of the needs of others, I will help keep the peace (and quiet). -Resourcefulness is my middle name, not really it is Lyn, but I have the keen ability to use what I have. Example: My brother-in-law cut his foot on a barnacle while we were at the beach, we had a 1/2 mile walk back to the car. I fashioned a baby diaper into a bandage/wrap for his foot, helping him to walk comfortably back to the car. -I am use to being up in the middle of the night and sparking to action in an instant, this will come in handy for the night legs. -Since I am 6'0 I have a large frame for any marketing materials, tattoos, socks, visor, etc… Use me as a Running billboard. -I have been practicing my Nuun-tails, I can be Tall Mom the Nuun-tender, Lemon+ Lime/Tri-berry coming up. 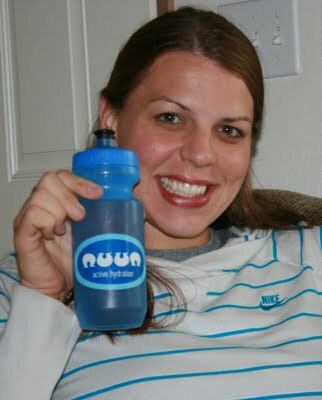 -Nuun should be represented by people who use and love the product, that is ME!! -Nuun is based in Seattle, I grew up 45 minutes South of Seattle, so Nuun and I grew up together. Since I saw Hood to Coast the Movie last year I have been JAZZED about running the relay. I was SAD to learn that I had already missed the cut for 2011. I put aside my dreams and was planning to FIND A WAY and a team for 2012. As a Mom, Wife, Runner and Full Time Career woman it is hard to pull together the logistics for a Relay Team. I am an Event Planner, I could do it, but it would be HARD and very taxing. Team Nuun is my chance to be a part of something so special without putting the extra time constraints on my family. This is the IDEAL situation for me. To top it off I will get to see my Blogger friends and meet new Bloggy Buddies. What an Experience!! 200 miles, 12 Female Bloggers, Hood to Coast, GO TEAM NUUN!! Just Imagine the Blog posts leading up to the event, the pictures taken, relationships built, and the various ways the stories will be told after.. It is going to be EPIC!! I hope that I will have the great HONOR to be a part of this all Female tea representing Nuun at Hood to Coast. Please leave a comment to let Nuun know why you think Tall Mom would be good for the team. Are you going to put in an application?? Let me know!! Nuun, Tall Mom on the Run should DEFINITELY be on your team! Seriously, I read this and couldn't think of a better blogger and runner to join their team! You give others drive and help your followers focus on our goals, all the while giving tips and tricks, and providing some laughter (and giveaways!) along the way. This relay is the next step in your running progress, and think you are a shoe in. I love your reasoning for being a part of the relay especially about being tall and easily seen for transitions. I just ran a relay for VCM and I was the tallest on my team, I'm barely 5'4", you can imagine how hard it was to see over the crowds. Tall women rule...Nuun should have you for this very simple reason but also because you are awesome and bright light and joy to all you encounter. I love that you would hold someone's hair back if they were sick. Mel....if anyone should be on that team you should. Good Luck!!!! Yes you should SO be on the Nuun team! You are the impedamy of team, fun, encouragement and positivity!! And for the record, I'd hold your hair back! I've decided not to submit, at this moment. I'm starting a new full-time job July 1 so taking days off in the first couple months isn't a good idea. I'll need to start saving up time off for family vacations and trips to see my dad. It kills me though. I'd give anything to run with you! Maybe I'll change my mind. You NUUN folks would be NUTS to not take Mel! Pick her pick her pick her!!! Nuun, she also managed to be an ambassador for your products and now my fiance is a believer in your products too. Tall Mom, If you are able to run this, I will anxiously await any race recaps because this is one of my goal races if ever possible. You are a shoo-in for sure! H2C is one of my bucket list races. I hope you make the Nuun team for the Hood to Coast relay. I would love to read your blog posts from the race. I too saw the Hood to Coast movie and have been dreaming about doing it someday. I hope I get to live vicariously through your blog posts. You certainly convinced me! And with that cape you look like you can fly. They should pick you because of your sheer AWESOMENESS! LOVE this post ... creative reasons at it's best! Looking forward to following you on this journey! You know all about being the best teammate as a former DI athlete! How could you not run for Nuun in H2C?!! Yes, take TMOTR!! She's the best!!! Having followed your blog for a while now you are VERY INSPIRING to all runners out there! NUUN needs you on their team! In case i didn't make it clear, the NUUN H2C team would completely benefit from having TMOTR as a teammate!! I am completing my application today in hopes of being your NUUN teammate! I just sent in mine too. Now the stress of waiting will try to kill me. Good luck! You would be a GREAT teammate! I sure hope we both make it. I also submitted an application. I would love to share a van, sleepless hours and a true adventure with you.